We’ve all seen the puffs of dust clouding up MET Quad and Western Campus, heard the drilling sounds of hammers and nails as construction workers prepare to construct new residence hall buildings. But what’s special about these building is that they will contain new “green” features to promote sustainability and a healthier environment for Miami University students to thrive. Maple Street Station, a new dining facility with a residence hall above, will be constructed with sustainability features along with several residence halls on the western side of campus. A geothermal energy plant is in the works containing 300 geothermal wells that will supply the new western campus halls with water as well as heating and cooling. Robert Bell, the project manager for Miami’s Physical Facilities Department, explains that these geothermal wells serve as more efficient forms of heating and cooling and they will help to reduce overall operational costs. Additionally, the Western Campus buildings will feature more bicycle storage, low-flow plumbing fixtures in the bathrooms and a personal thermostat in each room, so students have the option to control the temperature of their room based on personal preference. A final feature that has green movement supporters excited is the lighting occupancy sensor. If the system detects that no one is in the room, the lights will automatically turn off, saving energy and cutting costs. Bell says that these changes are something to look forward to while the university works to make Miami a healthier environment. 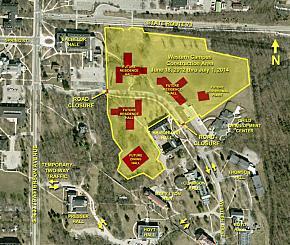 The Western Campus buildings are expected to be finished by the summer of 2014.